Beth Dooley: MINNESOTA'S BOUNTY ... many mushrooms! Hit the Farmers Markets on Saturday! It's a good month for oysters, mushrooms that is. They grow up the sides of dead trees, like small shelves. Well named, they are bivalve shaped, pearly white and nicely ruffled. You may find them when wondering through the woods up north or in town, at our farmers markets. They are far more delicate than the distinct morel, but still taste like mushrooms. 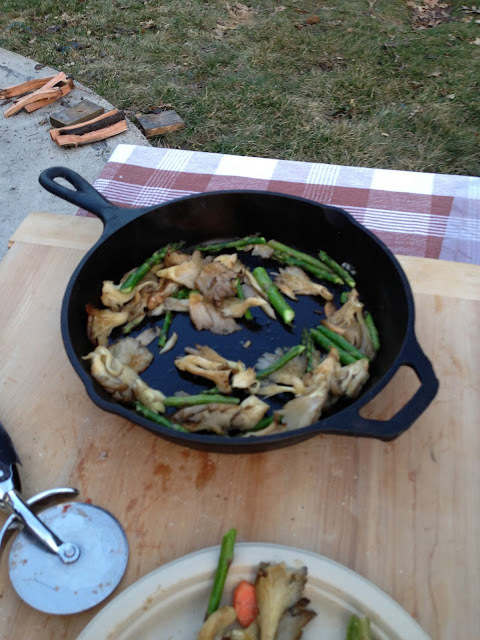 Delicious pan roasted with asparagus and or ramps and fiddlehead ferns and spring onions and anything else you can toss into the pan. Use enough oil and some salt, and sear them until they're slightly browned and tender. If you happen to have a friend with a pizza oven, and the moon is full, be sure to open several bottles of champagne, pull out a seasoned iron skillet and roast these mushrooms to top off that pizza. It is spring. Let the croakers strike up a chorus, kick back and sing along. Very good information dear real friendship can not be separated with diff. cultures and norms but fake ones are easy to shatter. This is an excellent blog where we can receive alerts different events that are interesting element for our.We can change the setting for our life from bethdooley.org. There are inexpensive Used ford trucks for sale these days if you know where to discover them. Discovering a used vehicle that meets your needs may be simpler these days than ever before.